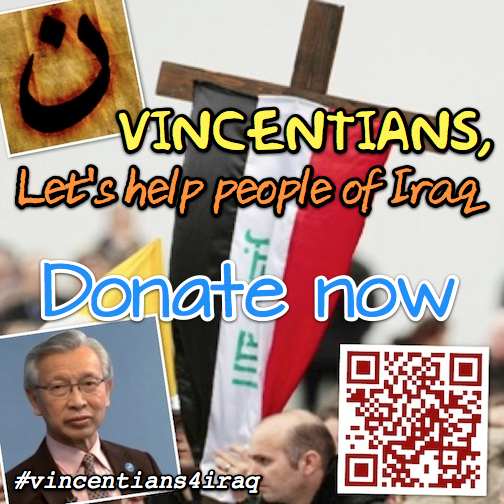 Dr. Michael Thio, President General of the Society of Saint Vincent de Paul (SSVP CGI) addresses a letter to Vincentian Family with an urgent and detailed appeal to support humanitarian aid efforts for persecuted people of Iraq with members of SSVdP among them. This message comes along with released earlier Circular by Fr. Gregory Gay, C.M. calling on the day of prayer for Iraq. The Peace and Love of Christ be with you. Please see the circular letter of 15 August 2014 from Fr. Gregory Gay, Superior General of the Congregation of the Mission (Vincentian Fathers), specifically referring to the atrocities being committed in Northern Iraq which has caused lives and hardships to thousands of people and Christians and especially affecting also members of our Society of St. Vincent de Paul. The Commission for International Aid & Development (CIAD) of CGI has been providing relief assistance to the Iraqi refugees and displaced people and also those in Gaza cause by this war-torn crisis along with SSVP Lebanon and SSVP Palestine. We have limited funds available in CIAD from the General Disaster & Solidarity Fund as we have informed you in a circular issued last month and we can only do limited amount of aid. We are making an urgent general appeal to you for donations/contributions for us to continue to undertake relief assistance humanitarian work to help the suffering and persecuted Iraqis. We seek your compassion and generosity to send donations to CGI for the “General Disaster and Solidarity Fund” so that we can do more for the victims of this dreadful crisis. Let us unite in special prayers for the people in Iraq and that the horrendous situation they are experiencing will abate and peace and sanity will prevail. We pray for the intercession of our Mother Mary, St. Vincent and Blessed Frederic. In Jesus adorable name, we pray. God’s Grace and blessing be to all of you.